Why create such a map when hints of the area’s seismic history are plainly displayed on its surface? The corrugated Surprise Valley Fault snakes 85 kilometers along the Warner Mountain Range, the landscape is pocked with smaller surface scars, called fault scarps, that indicate movement along faults, and hot springs billow steam–proof that the area is anything but quiet. But although some faults and fractures are visible on the surface, some remain completely hidden underground. And even if researchers know where the hot springs are located, they want to understand how hot spring fluids flow through the network of pores and channels underground. Investigating this geothermal fluid circulation system includes identifying faults below the surface that might conduct the hot mixture of fluids and minerals found in the hot springs. These faults also have the potential to rupture during an earthquake, and the detailed studies will help refine predictions of how likely and how damaging earthquakes could be in the region. Later, the team will compare magnetic data to topographic data they’ve already collected in order to correlate subsurface structures to areas of surface offset, or displacement from the fault center, which indicate active faulting. At the end of the U.S. Geological Survey (USGS)-led, NASA-funded project, which includes a second field session scheduled for next year, they’ll produce a 3-D map that will provide geophysical data on Surprise Valley at a level of detail yet to be achieved for the area. This map will be crucial for predicting the likelihood of earthquakes in Surprise Valley and the damage they may do. The Surprise Valley municipal government can also use the map to inform land and water use decisions, since toxic water zones have been identified in the area, as well to help tap the geothermal system as a sustainable energy source. The team, which includes scientists and engineers from USGS, NASA-Ames, Central Washington University, and Carnegie Mellon University, will measure magnetic fields using ground surveys and an unmanned aerial system (UAS) to map the geophysics below the surface of Surprise Valley. Over the years, they’ve collected a wealth of magnetic data by foot and small, four-wheel all-terrain vehicles, or ATV. But the areas they can safely and feasibly survey on the ground are limited. They can’t walk through private lands, dense vegetation, or hot springs, for example. Geoscientists have typically addressed this challenge by contracting pilots to collect data along a specified flight path. Not only are these manned aerial surveys costly, they require pilots to fly at dangerously low altitudes. That’s why the Surprise Valley team will collect data with a small, lightweight, low-flying UAS known as SIERRA (Sensor Integrated Environmental Remote Research Aircraft). 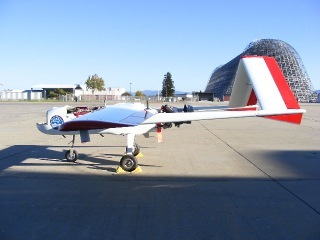 While flying along a preprogrammed path, the NASA-developed SIERRA will relay the data collected by a magnetometer in its wing to a ground station computer. SIERRA is available for other research projects involving the collection of data from inaccessible swaths of land. Scientists have already employed SIERRA in the NASA-funded Characterization of Arctic Sea Ice Experiment (CASIE) to assess the decline in the ice covering Alaska’s Beaufort Sea. While SIERRA offers a safer alternative to manned flight, it still has some limitations. With a specified flight path, both manned aerial surveys and UAS run the risk of bypassing interesting geological features. 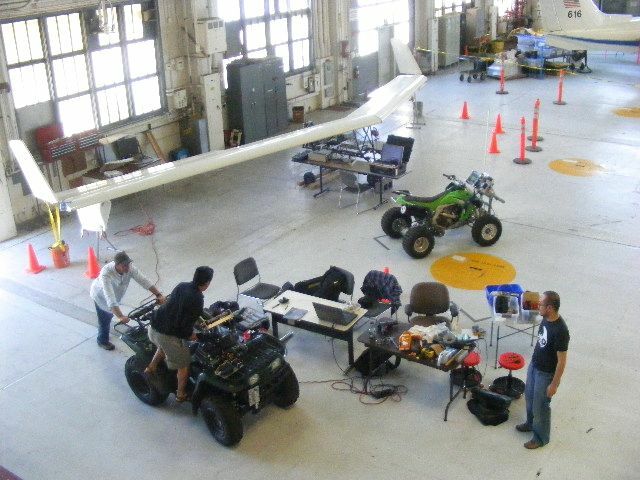 Next year, the Surprise Valley team will collect magnetic data using NASA’s Swift “smart” UAS. The major difference between the two platforms is that an on-board system navigates Swift based on feedback it receives on both magnetic data and environmental conditions, such as wind speed and direction, or obstacles in its path. The system, known as an adaptive payload system, will integrate the magnetic data that Swift’s magnetometer has collected with magnetic datasets into an algorithm that will then “decide” how to adjust Swift’s flight path to maximize data collection in areas of interest. The team will compare the datasets collected by the two UAS platforms with the goal of developing a cheaper, more effective airborne survey system. This field season, the team will run additional tests on SIERRA’s ability to correct for magnetic noise associated with the magnetization of the aircraft that would otherwise obscure signals arising from geologic structures we’re interested in. Faults and fractures generate magnetic fields that deviate from those emitted by regions of the valley that lack these features, but so do the aircraft and its maneuvers. SIERRA needs to subtract these readings to ensure that any anomalies that appear in the magnetic data reflect solely features below the surface. The researchers will then fly the aircraft in a broad zigzag pattern across Surprise Valley, collecting magnetic data from large features in previously unexplored areas. These data will be important in planning next year’s mission, when Swift will conduct more detailed surveys of the region. The team will concurrently test the payload system by comparing these data against the data collected by Swift. 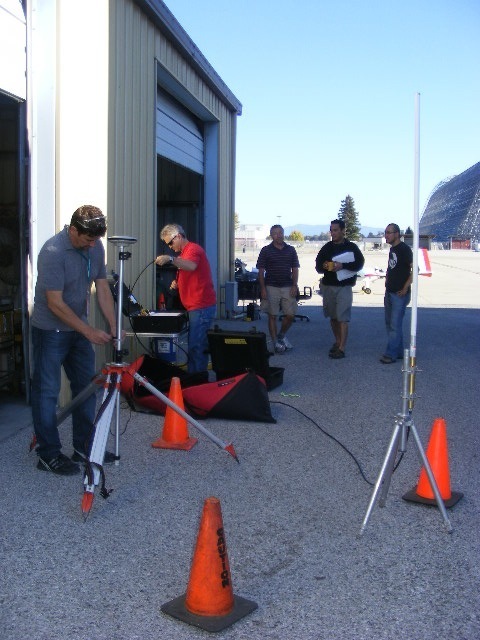 Team members testing the ground base station systems. These include: the differential GPS, which will enhance the accuracy of the GPS readings of SIERRA’s location (left); the antenna that will relay information from SIERRA’s on board radio about the aircraft’s mechanical status and location (right); and the ground magnetometer (not shown), which measures the daily temporal variations in the Earth’s magnetic field due to fluctuations in the upper atmosphere. Researchers will subtract ground and airborne magnetometer data to correct for these daily variations and reveal the signals due to the faults and fractures they want to map. While airborne magnetic surveys offer complete coverage of an area, there are still reasons to do ground-based surveys. Since a magnetic field weakens with increased distance from the magnetic source, aerial surveys can only detect large fields produced by the gross characteristics of a source below the surface. On the ground, researchers are able to pick up on the more subtle fields produced by a source’s smaller features. During both field sessions, the team will continue to collect magnetic data by foot and ATV in addition to UAS and will perform gravity measurements along some of the same subsurface structures. They’ll also drill rock cores to measure remnant magnetization, a record of the magnetic fields at the time the rocks formed, and collect samples from the area to determine density and magnetic susceptibility, which is a measure of how “magnetizable” a rock is. These data will collectively be used to develop gravity and magnetic models to determine the geometry of structures below the surface. The National Center for Airborne Laser Mapping has already mapped Surprise Valley’s surface features, or topography, using airborne lidar, a highly sensitive technology that can make out even tiny features—visualizing objects and distances as small as a few centimeters. Lidar bounces a laser off the landscape, making a detailed 3-D topographical image. Unlike magnetic field data, which can identify structures below the surface but tells us nothing about their activity, lidar can distinguish active from inactive structures, since only structures that have been active in the recent past produce fault scarps and other areas of surface offset that would still be visible. Otherwise, erosion and sedimentation would have wiped them out. After tying surface offset to subsurface structures, scientists can develop models for the area’s seismic activity. On this blog, also hosted at USGS’ website and Scientific American’s Expeditions we’ll share updates on daily missions, glimpses of life in the field, and profiles of individual team members. We’re excited that you’ll be joining us! All photos by Melissa Pandika. You can follow the Surprise Valley team on Twitter @SV_UAS, and view more photos of the team in action on their Flickr photostream. About the Author: Melissa Pandika is a journalism master’s student at Stanford University. Previously, she studied molecular and cell biology at the University of California, Berkeley and investigated how highly aggressive brain tumors evade therapies that block blood vessel growth at the University of California, San Francisco. You can follow her on Twitter @mmpandika.